October 24, 1926: The Gumm Family gave their last known performance in Grand Rapids, Minnesota (their hometown and Judy’s birthplace). The family performed at a bridge party held at the home of the Powers family. October 24, 1934: “The Garland Sisters” performed in the Florentine Room of the Beverly Wilshire Hotel in Los Angeles, California. They sang with Vincent Lopez and His Orchestra. The show was broadcast on the radio at 10:30 p.m. local time. No recording of this broadcast is known to exist. 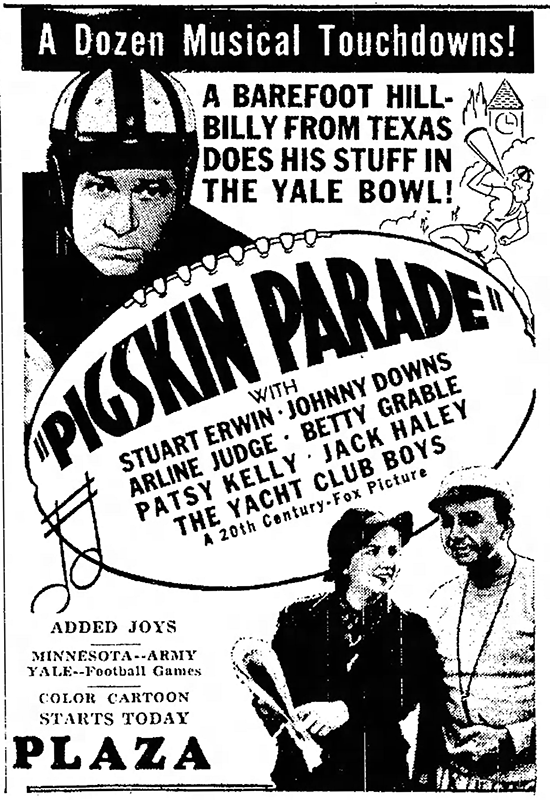 October 24, 1936: Pigskin Parade was proving to be quite popular. 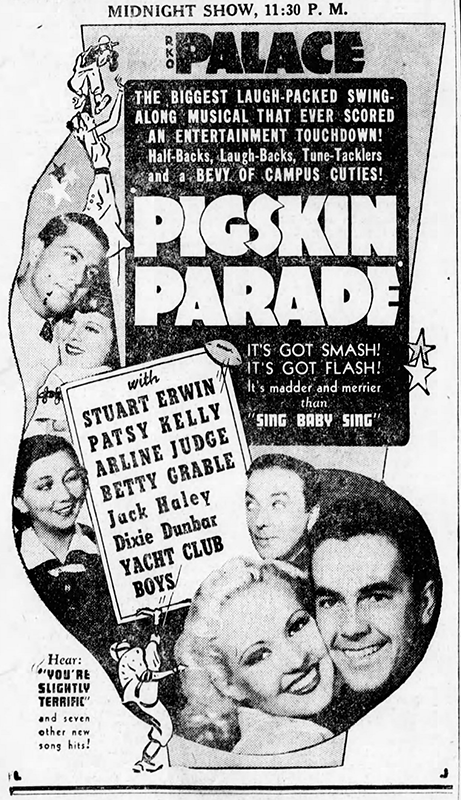 Even though Judy had a small part in this, her feature film debut, it turned out to be the perfect vehicle to introduce her talents to the greater moviegoing public. Judy was usually singled out in reviews for much deserved praise. October 24, 1937: Judy had an MGM pre-recording session with Mickey Rooney and Ronald Sinclair. They prerecorded the finale version of “Got A Pair Of New Shoes” for Thoroughbreds Don’t Cry. Later that evening Judy appeared on the WOR Radio show “Thirty Minutes in Hollywood” starring George Jessel. 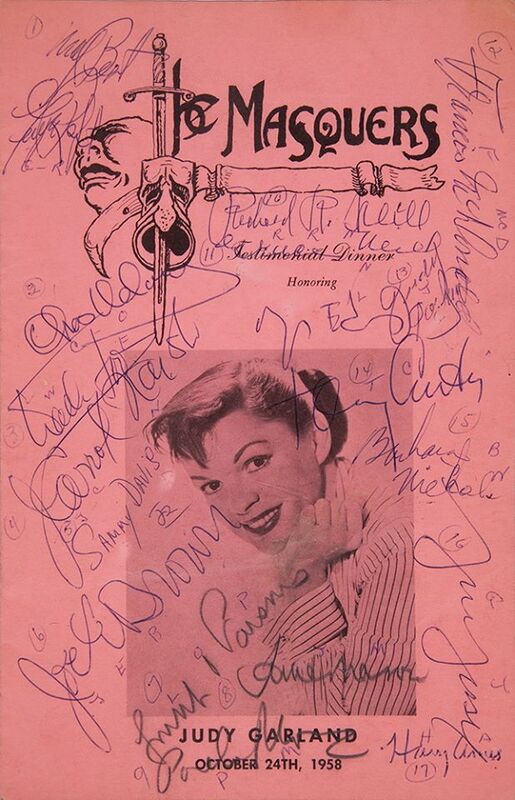 Judy sang “(Dear Mr. Gable) You Made Me Love You” to promote the recently released Broadway Melody of 1938. Listen to this show below. Note that the sound quality is very poor. This is a recording in desperate need of restoration! 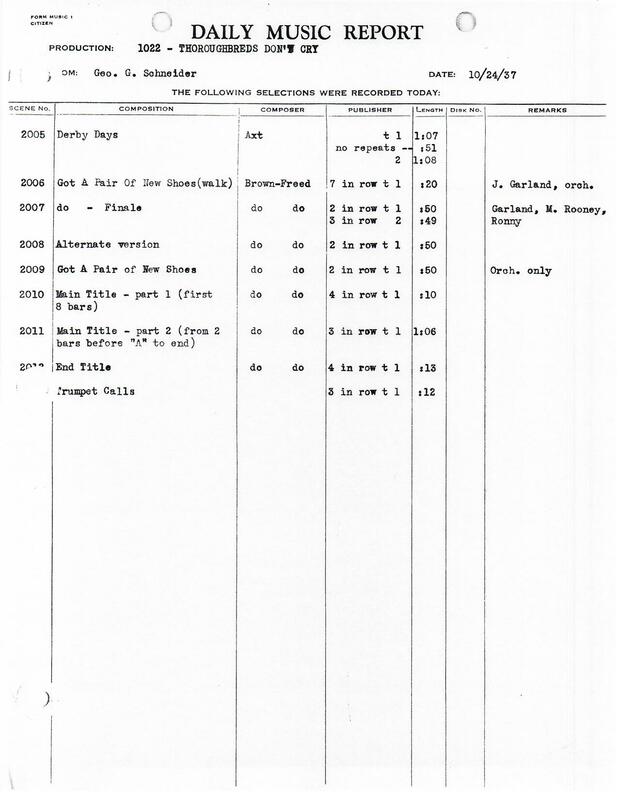 Judy’s appearance is in the second half of the program. 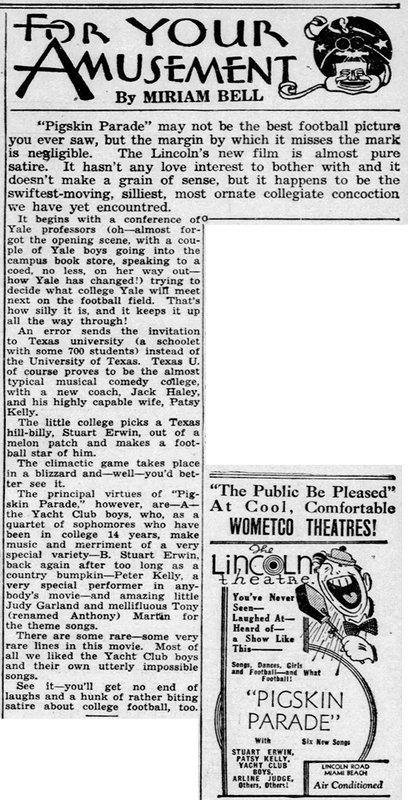 October 24, 1937: More studio fed fiction, presumably. 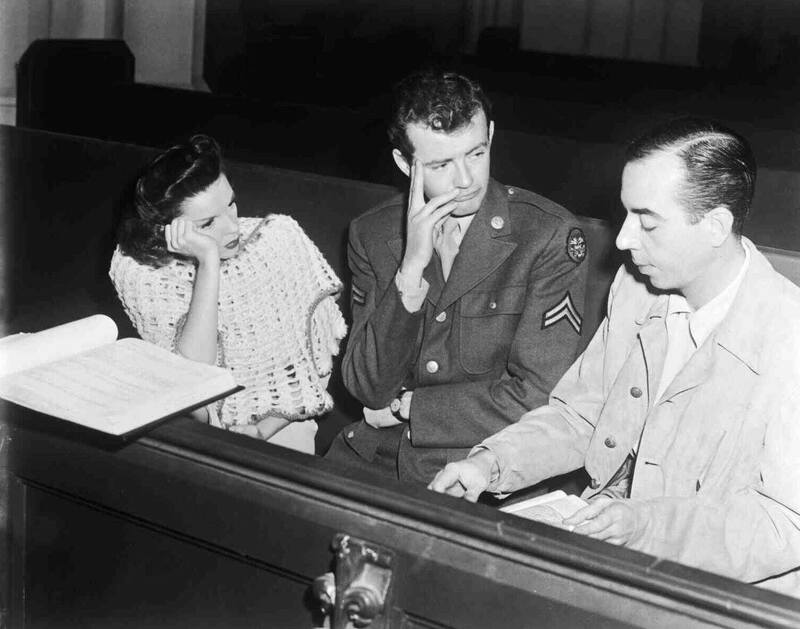 This time the studio’s resident crooner Nelson Eddy allegedly took Judy to his vocal coach who exclaimed that Judy’s voice was perfect the way it was and she needed no lessons. 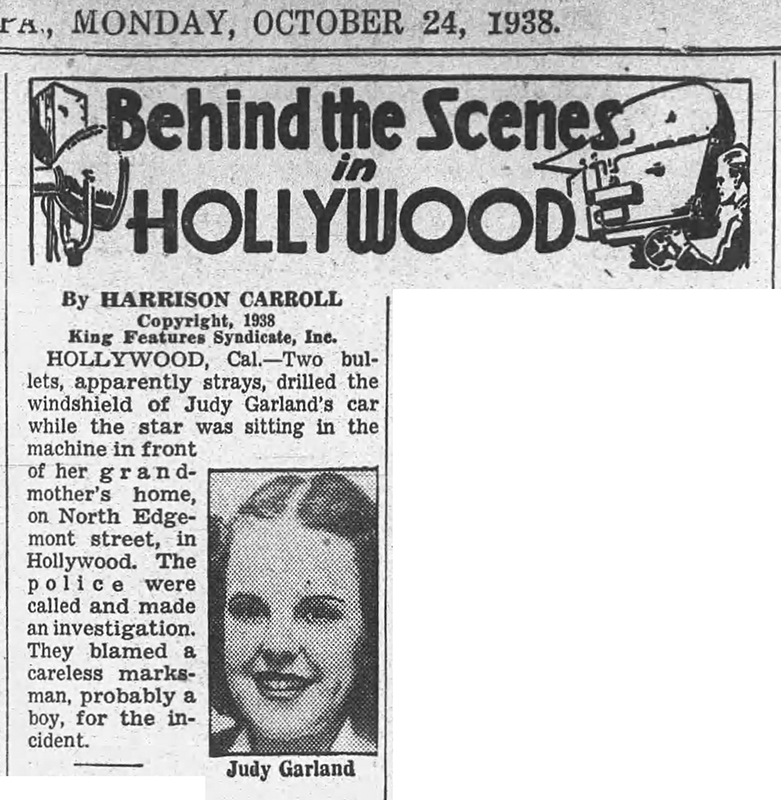 October 24, 1938: According to Harrison Carroll, two stray bullets hit the windshield of the car that Judy was sitting in while visiting her grandmother’s home on North Edgemont Street in Hollywood. October 24, 1938: Filming on The Wizard of Oz was halted. Just a few days before, on October 21st, original “Tin Man” Buddy Ebsen had an allergic reaction to the aluminum makeup and was hospitalized. It was clear he wouldn’t be able to finish the film. Producer Mervyn LeRoy and uncredited co-producer Arthur Freed reviewed the footage shot thus far under the direction of Richard Thorpe. They were, to put it nicely, unhappy with the results. 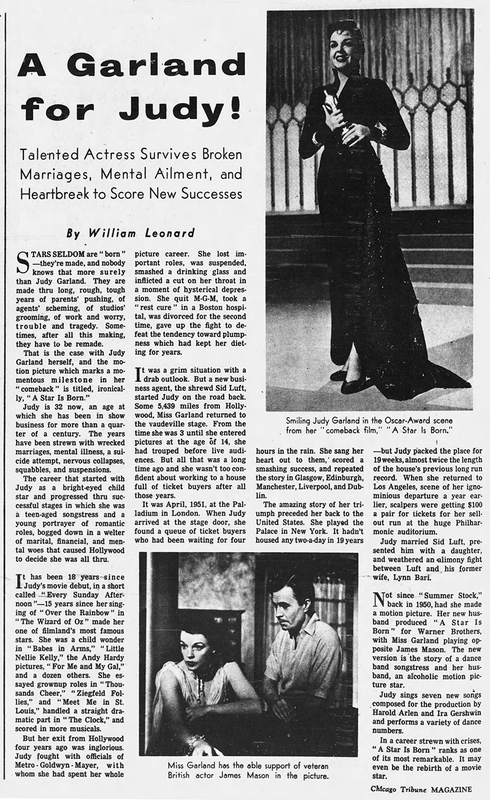 Thorpe apparently had no feel for the fantasy element of the story and had Judy acting in a “fairy princess” manner. No footage from these early weeks of filming exists. It was decided to scrap everything and start anew. 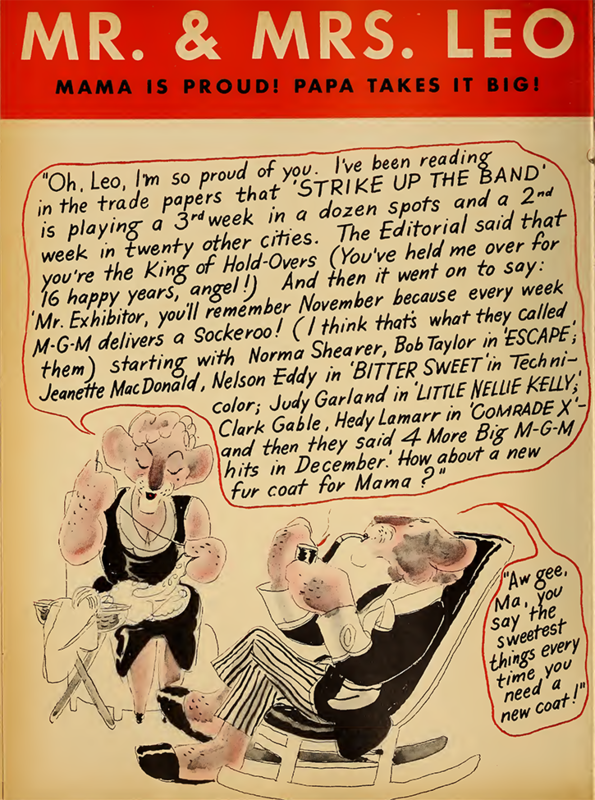 Thorpe was fired and George Cukor was brought in for a week as a temporary consultant. 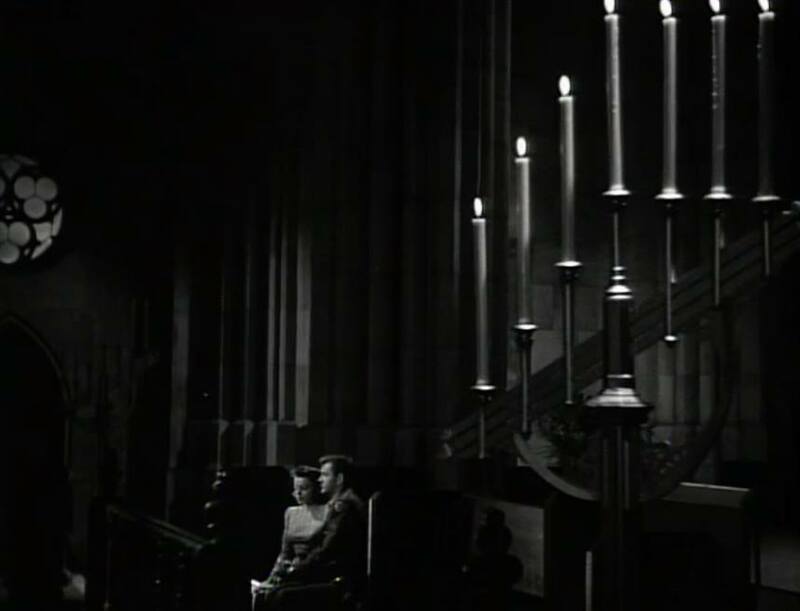 Cukor made many changes in the appearances of the main characters. Even the Yellow Brick Road got a makeover. Most importantly he got rid of Judy’s blonde wig and heavy makeup, bringing her back to her natural dark hair and little makeup. He told her to play the role in a natural manner and to “remember you’re just a little girl from Kansas.” His changes and advice altered the look and feel of the film. Without his guidance, The Wizard of Oz wouldn’t be the masterpiece that it is today. 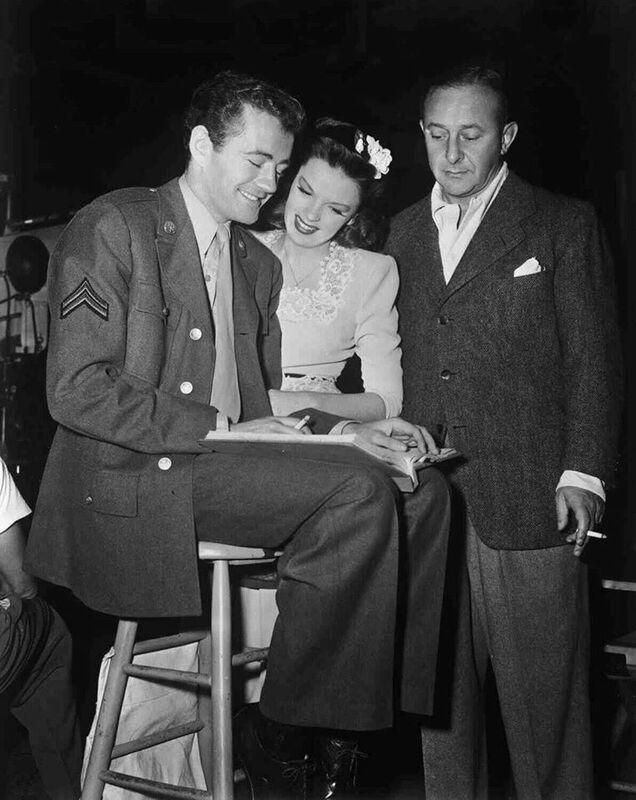 Victor Fleming was brought in as the film’s new director and filming resumed on November 4th. 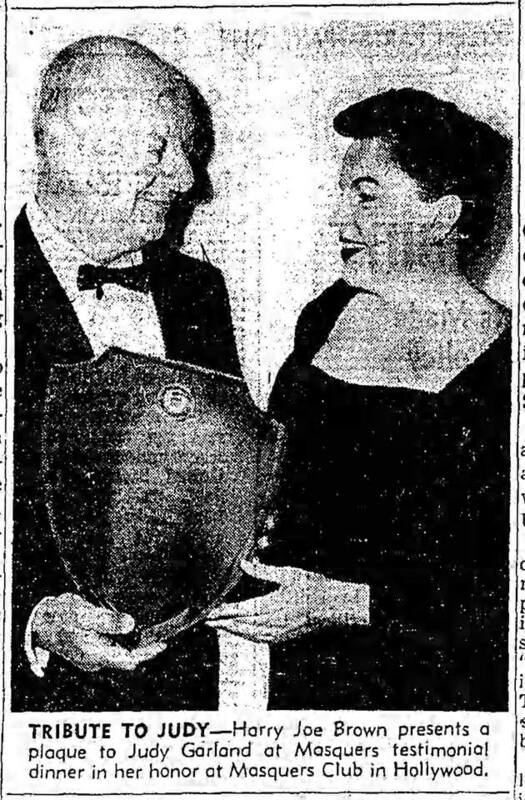 October 24, 1939: Judy’s weekly appearance on “The Pepsodent Show Starring Bob Hope” broadcast out of Hollywood by NBC Radio. 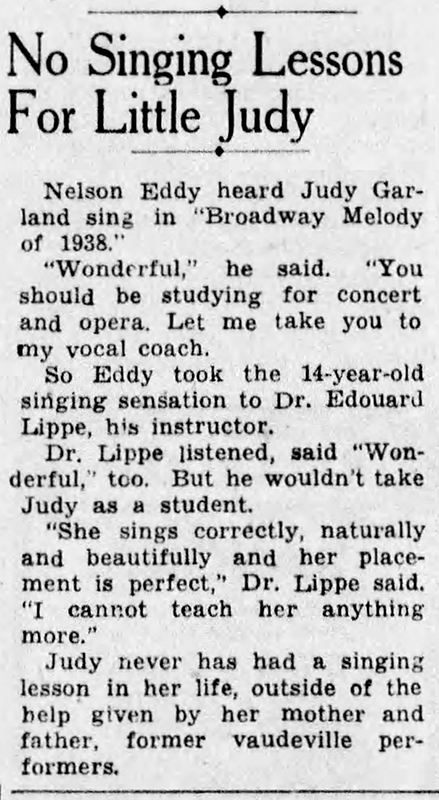 No details nor recordings of this broadcast have survived so it’s anyone’s guess what Judy sang. Most likely she sang something from the recently released Babes in Arms. 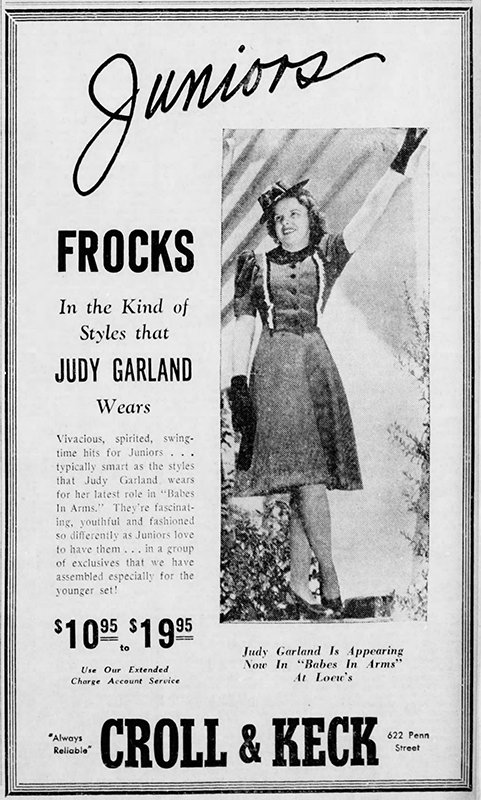 Published on this date in Reading, Pennsylvania, was this great ad for Judy Garland frocks, shown above. 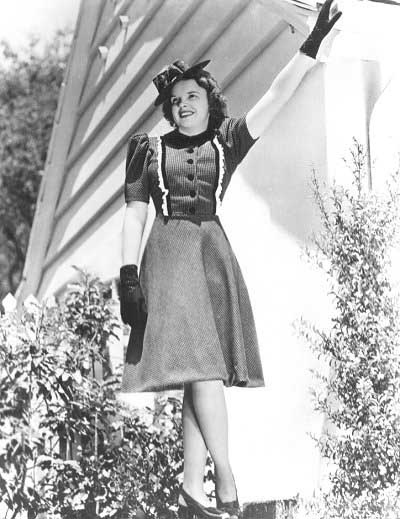 October 24, 1940: Judy posed for publicity photos, including some with the new “Judy Garland Doll” that was available nationwide. The doll is shown wearing a versionJudy’s Strike Up The Band finale costume. 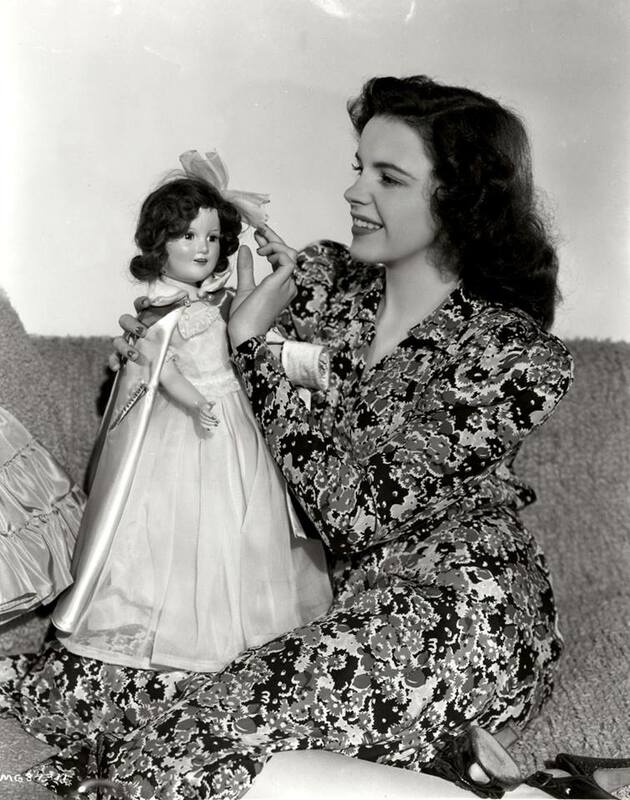 Included is another photo of Judy with the doll, presumably from a later photo session, plus an MGM trade ad promoting their recent and upcoming films including Strike Up The Band and Little Nellie Kelly. 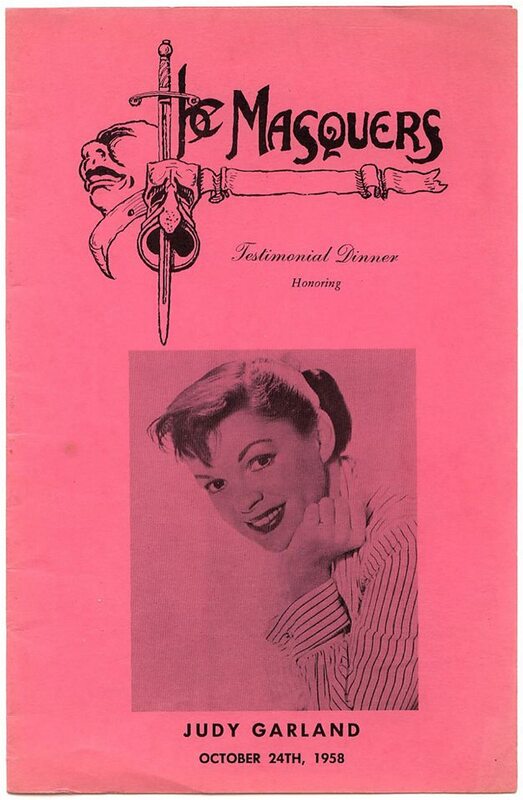 “How About You?” and “FDR Jones” were both sung by Judy in Babes on Broadway which had just completed filming. 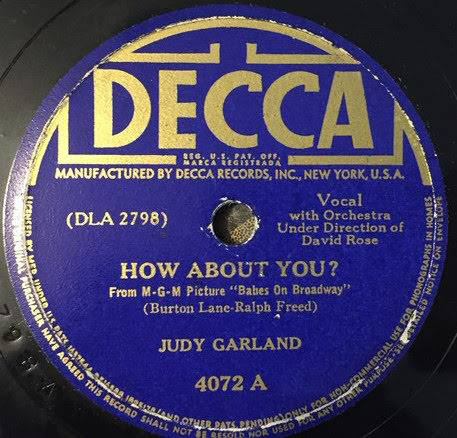 The two singles were paired together on Decca single #4072 and released in November 1941 with “How About You?” on the “A” side. 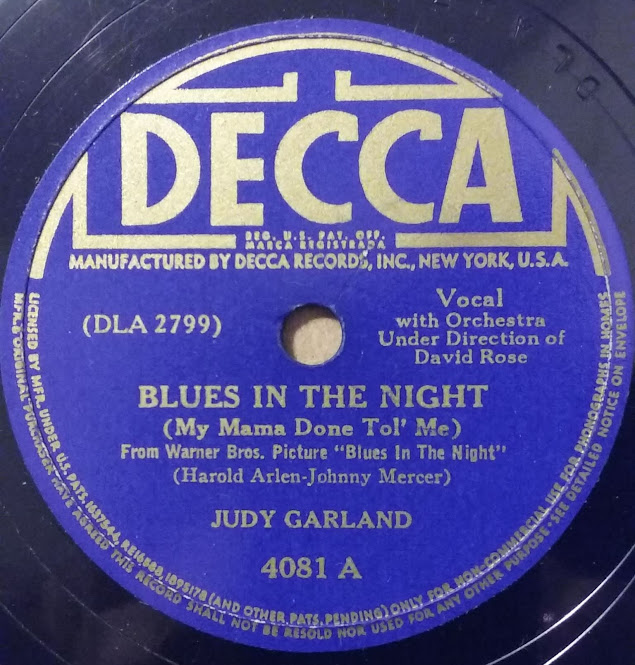 “Blues In The Night” was also released in November 1941, on the “A” side of Decca single #4081. 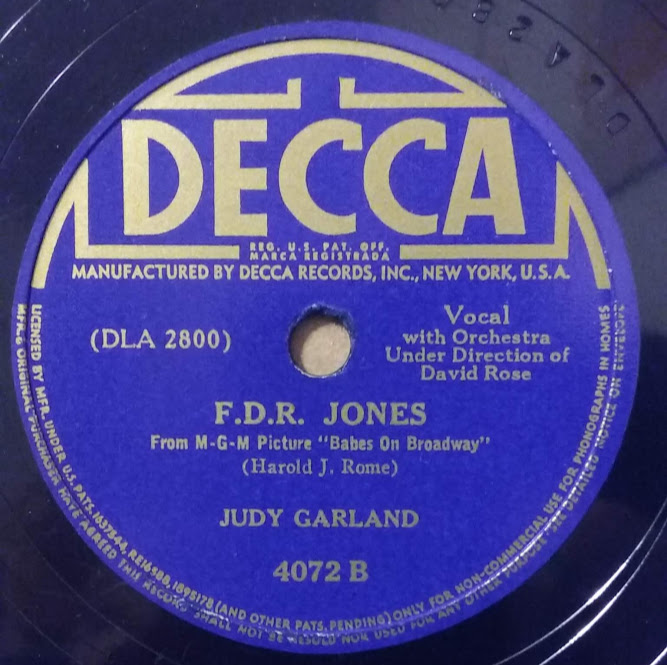 It was paired with a re-release of Judy’s April 10, 1940, recording of “(Can This Be) The End Of The Rainbow” on the “B” side (originally released in September 1940). 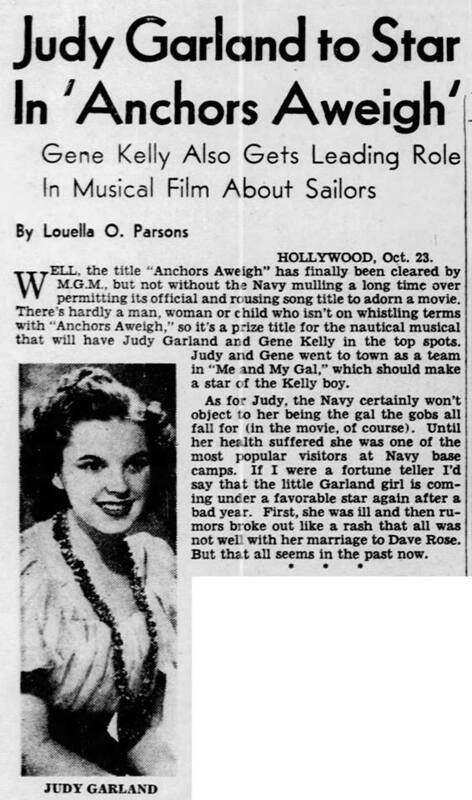 October 24, 1942: Another “film that got away.” Judy was allegedly in the running to co-star in Anchors Aweigh during early pre-production. 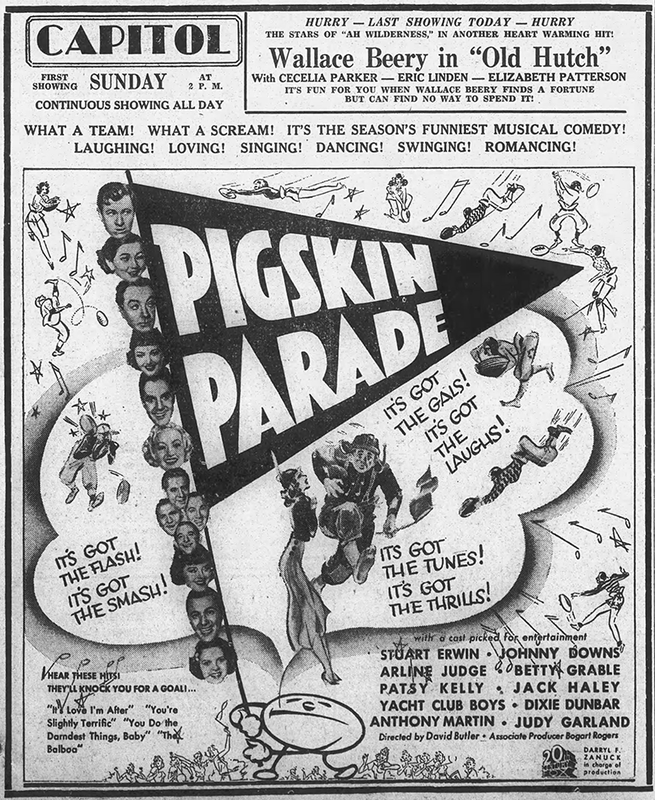 The film ended up starring Gene Kelly, Frank Sinatra, and Kathryn Grayson and was released in 1945. It was such a success that Kelly even got an Oscar nomination for “Best Actor” for his role! Designed to boost civilian morale in wartime, songs of World War I and II were heard on Broadway at a midnight community sing held in Times Square Wednesday night. 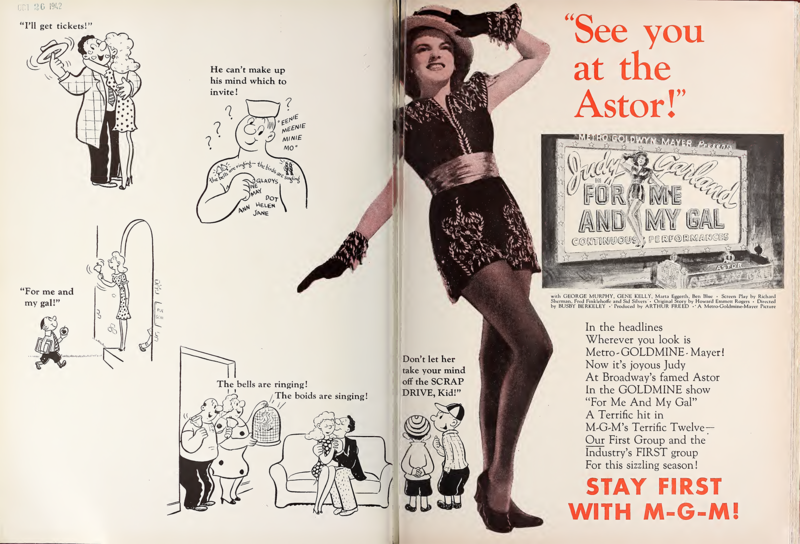 First of a series of planned for various cities, the National Y.M.C.A.-sponsored song fest was inspired by the stirring songs of the last war which are included in the score for “For Me and My Gal,” which Metro-Goldwyn-Mayer brought into the Astor Wednesday morning. 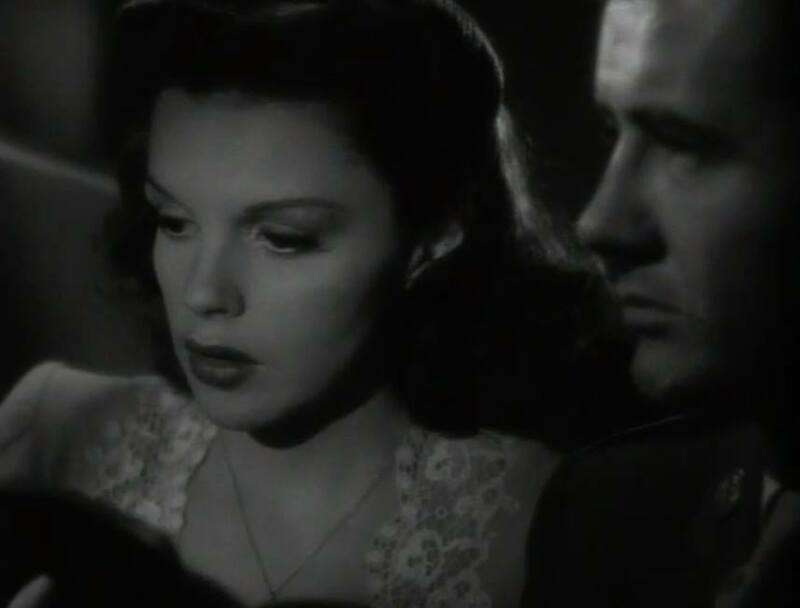 In one of the film’s sequences Judy Garland appears as a Y.M.C.A. canteen worker who tours the battlefields and leads the soldiers in community sings. The Y is acknowledged to have buoyed the morale of soldiers in World War I, and the mass vocals held Wednesday night were designed to contribute the “fighting spirit” demanded by today’s war. John R. Jones, one of the national Y.M.C.A. sing leaders, conducted the midnight sing in the Times Square area on the East Side of Seventh Avenue between 45th and 46th Street. Various stars of the stage participated in the novel undertaking, and songs popularized in the current conflict were augmented by a full score of war songs from World War I. 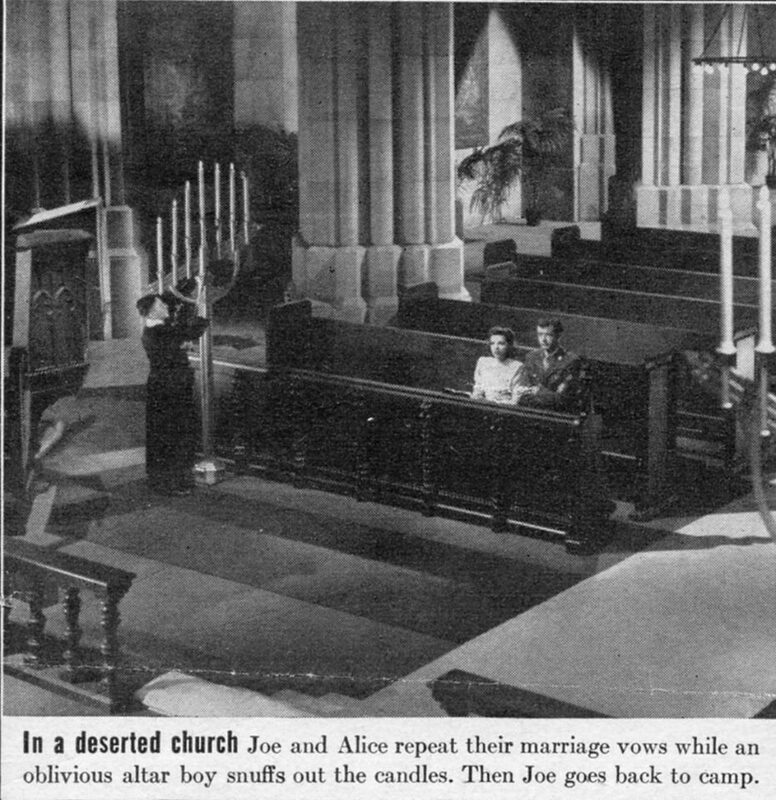 For the benefit showing Tuesday night under the auspices of the New York Infirmary for Women and Children, ten large bells erected on the towering sign atop the Astor rang out the melody of “For Me And My Gal” through a special public address system. The bells dangled approximately one hundred feet over Broadway. It was expected that the stunt would be retained during the film’s Astor engagement. 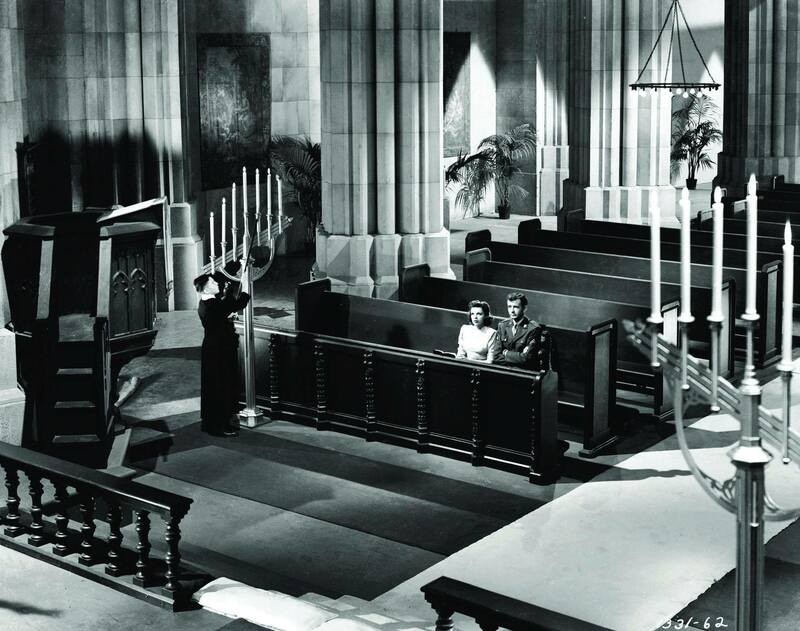 October 24, 1944: The Clock filming continued with scenes shot on the “Interior Marriage Chapel” and “Interior Church” sets. 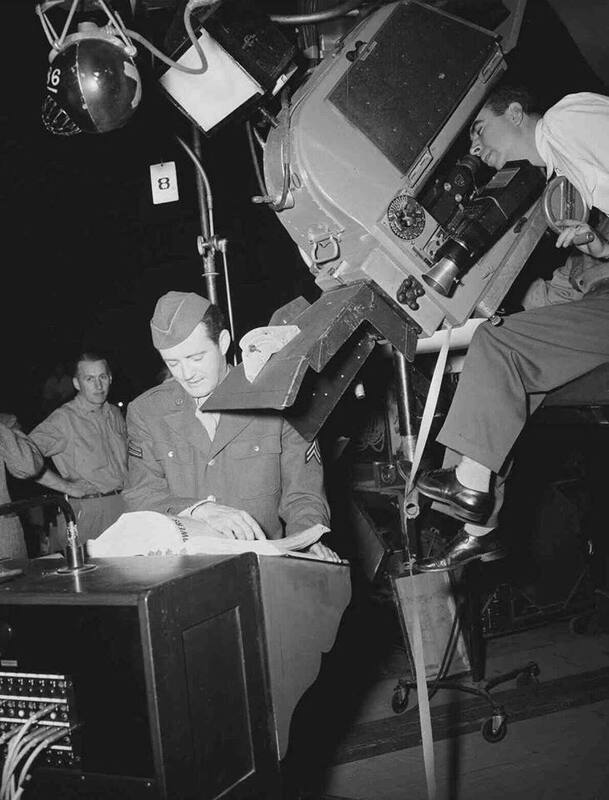 Time called: 10 a.m.; time dismissed: 5:50 p.m.
October 24, 1945: Filming on Till The Clouds Roll By continued on the “Interior Stairs” set (the “Who?” number). 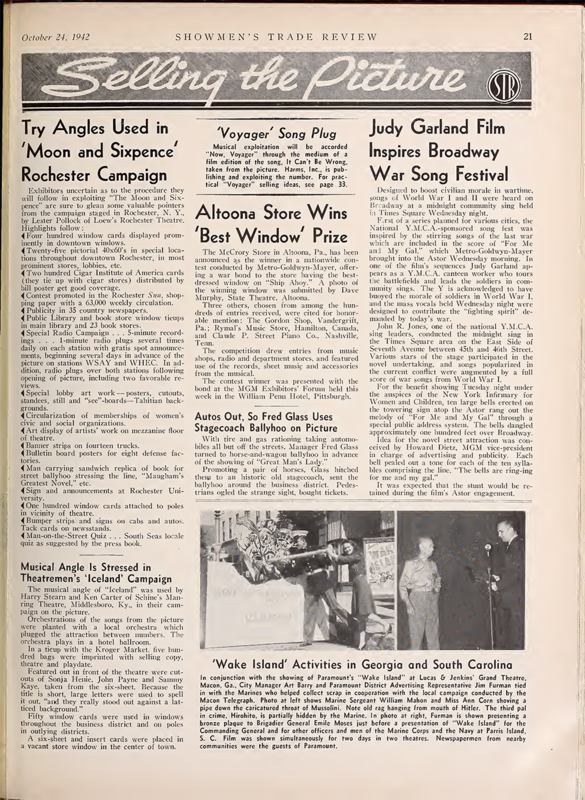 Time called: 10 a.m.; dismissed: 5:30 p.m.
October 24, 1954: Two A Star Is Born related articles. 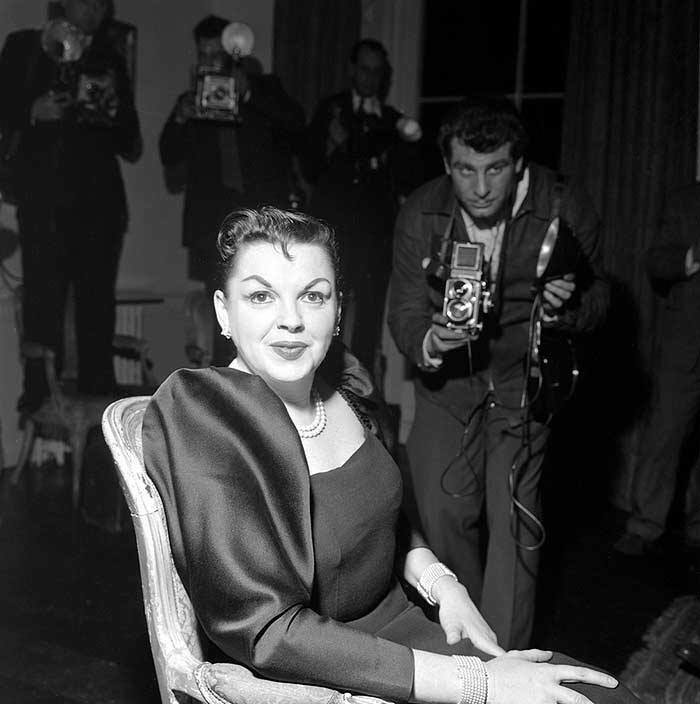 The first is about Judy’s life in show business, generally speaking. The second is about the film’s New York premiere on October 11th. 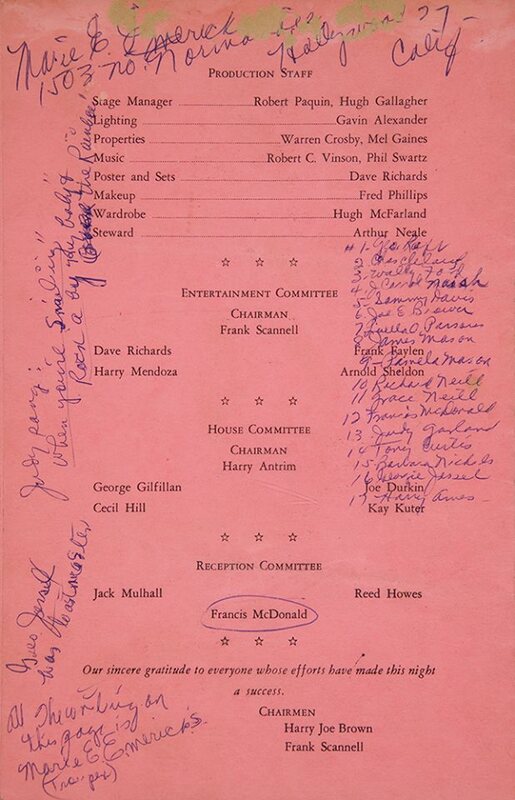 The signatures on the program (as shown here) included: Judy, Vincent Minnelli, George Raft, Tony Curtis, Janet Leigh, Louella Parsons, Harry Joe Brown, Sammy Davis Jr., George Jessel, Wally Ford, J. Carrol Naish, Joe E. Brown, James and Pamela Mason, Richard and Grace Neill, Francis McDonald, Barbara Nichols, and Harry Ames. October 24, 1962: Gay Purr-ee was released on this day. The film, Judy’s only animated voiceover work, wasn’t a big hit when first released but has developed a kind of cult following over the years. It’s also more admired now for its animation art and adult themes.